The colorful city of Trinidad was my favorite stop of the trip. Everything from the town and landscape to the people, music, and cuisine were just right. This Afro-Cuban city has so much grit and charm, it’s lures you in on arrival and possesses you after just a day. Hostal La Salernitana : A recommendation from our shared taxi driver, this casa is run by a sweet and amazing mom – Mayra. She adores meeting people from all over the world and prides herself on having guests from multiple countries, especially when they’re all under her roof at the same time. She’s patient to guests trying to learn Spanish and loves to exchange life stories. The location of the casa is quite central; just a few blocks from the main squares, grocery stores, and banks. It has all the necessary amenities and a quaint verandah in the center of the building. San Francísco de Asís : This church and belltower are smack in the center of Trinidad. Climb to the top for 1 CUC to get beautiful 360 degree views of the town, mountains, and ocean in the distance. Wander the side streets outside the main squares. Make some time to just sit on the sidewalk in the shade to observe the locals and their way of life. Chat with the old folks that hang out of their doors watching the passersby. Learn Salsa! 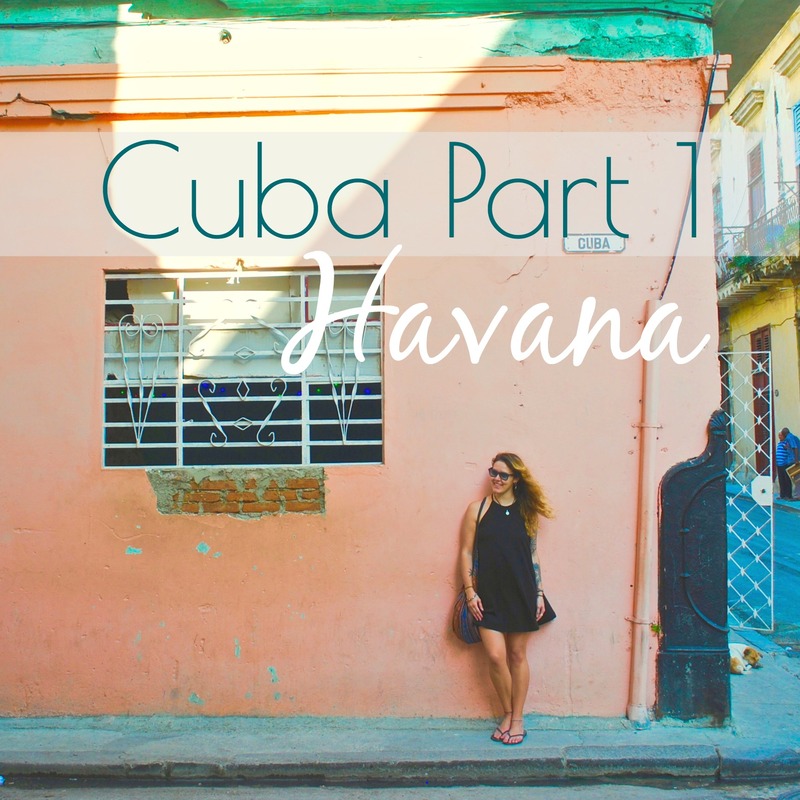 There’s no time like the present and no country like Cuba to get some Salsa classes in. Watch the sunset from Hotel Las Cuevas. It’s close enough to walk up to but it’ll give you a bit of exercise if you didn’t already walk enough that day. The view of the sunset over the ocean is spectacular but don’t bother with a mojito, they weren’t the best and were overpriced. Spend the day at Playa Ancon : There’s plenty of beach and natural shade under the trees for an afternoon of swimming and napping (beware of the sand fleas!). It’s about a 40 minute bike ride from the center of town, which is great to take in the early morning. There are a number of hotels along the beach and small beach bars with mojitos and music to get you in the mood for an evening out! Day trip to the waterfalls of El Nicho : Take a guided trip via the professional agencies in town or just a shared taxi. El Nicho is a great place to hike under the shade of the forest and relax in nature. Sol y Son : My favorite restaurant so far, this restaurant is perfect for a quiet lunch in the courtyard. Though it gets packed during dinner, I prefer the attention to hospitality and same great quality for a daytime meal. Many of their specialties include chocolate sauces as it’s popular Cuban product. They also prepare samosas, Amarillos, curry dishes, and the Cuban classic: “Ropa Vieja”. Bar Restaurante Esquerra – Though ‘bar’ is in the name, this restaurant is best for dinner. Located smack in the middle of the main square (where there’s wifi! ), this popular restaurant is known for it’s lobster and excels in other dishes & drinks as well. La Cueva : LOVED this place! ‘The cave’ is buried underground in a legitimate cave (as the name suggests)! It’s a little sketchy and tedious to get to but every local knows it and can guide you, just ask. It generally opens at 11pm and has a reasonable cover charge. Inside are high, cavernous ceilings which umbrella over a large dance floor and raised DJ booth with lights and video screens. One thing to note for females – you are required to bag check anything larger than a small cross-body purse or wristlet, so don’t bring anything you won’t remember to pick up at the end of the night! Red Castle hotel on the walk up the hill to La Cueva : I’m guilty of not writing down the actual name of this place and googlemaps won’t be of any help, but you can’t miss it by the description I gave. It’s the best stop for pre-drinks on the walk to La Cueva. It’s generally an accommodation but the huge outdoor sitting area and tiki bar are perfect to lounge in before La Cueva opens. Raul is a serious gentle giant that’ll make you a mean canchanchera and let you pick whatever music you’re in the mood for. He’ll even give you a to-go cup when you’re ready for the walk up! ‘Canchanchera’ : The drink of Trinidad. Getting To/From : The Viazul bus has daily routes to/from Trinidad via Havana, Varadero, and other main cities on the island. Trinidad is a popular destination, so shared taxis go that direction from almost any city, big or small. The bus is a better price, but if you can pay a bit more for the taxi, you’ll be able to take a few detours and learn about the countryside from your driver (if you speak Spanish). For onward travel from Trinidad, the Viazul has an office on Calle Boca. Again, taking a shared taxi is a fine option. You can find plenty of taxi organizers along Calle Boca outside of the Viazul office trying to sell their business. Taxis usually depart at 9am every day so it’s best to organize the night before and they’ll pick you up directly from your casa. Wi-Fi : The Trinidad Terraces in Plaza Major are the main spot for a fast connection. You can’t miss the spot because flocks of tourists gather on the steps at all hours of the day. The busiest time is in the evening after 8pm when visitors are checking their messages before dinner and a night out. It’s quite a scene to witness! Mosquito Spray : I absolutely suggest bug/mosquito spray if you intend to do any hiking in the forests outside the city or even watching the sunset from up at Las Cuevas.